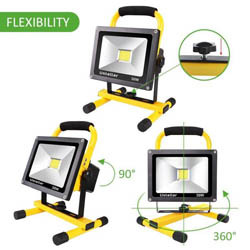 Heavy Duty 2400 Lumen Rechargeable 30W LED Rotating Weatherproof Work Light / Flood Light - Great for camping, work and more! Stays cool to the touch! 11" tall and the base is 7.5" x 8.6" - This thing is awesome! $36 on amazon! GREAT gift too!! - Order 2 or more for just $19.99 each! - SHIPS FREE!